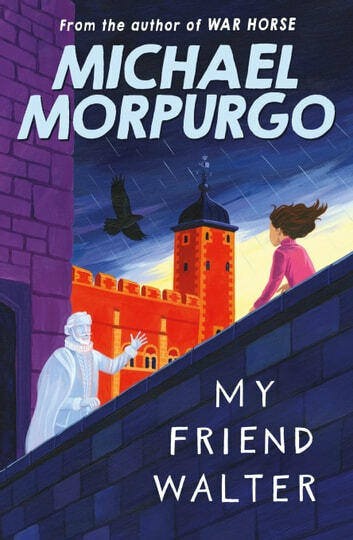 A hilarious tale of history come to life, from former children’s laureate and master storyteller, Michael Morpurgo. Living with a ghost can have its difficulties, I discovered, even if he is your friend. Remember Sir Walter Raleigh, who laid his cloak in a puddle so Queen Elizabeth I could walk across? Well, Bess meets his ghost and finds out she’s his ancestor! How will Bess explain Sir Walter to her family? Especially when he breaks her brother’s fishing rod, steals a horse and smokes cigars in her room! Michael Morpurgo demonstrates why he is considered to be the master storyteller, with a uniquely funny take on spirits from the other side. Look out for Michael's other ghostly stories The Ghost of Grania O'Malley and The White Horse of Zennor. Former Children's Laureate Michael Morpurgo needs no introduction. He is one of the most successful children's authors in the country, loved by children, teachers and parents alike. Michael has written more than forty books for children including the global hit War Horse, which was made into a Hollywood film by Steven Spielberg in 2011. Several of his other stories have been adapted for screen and stage, including My Friend Walter, Why the Whales Came and Kensuke's Kingdom. Michael has won the Whitbread Award, the Smarties Award, the Circle of Gold Award, the Children's Book Award and has been short-listed for the Carnegie Medal four times. He started the charity Farms for City Children in 1976 with his wife, Clare, aimed at relieving the “poverty of experience” many young children feel in inner city and urban areas. Michael is also a patron of over a dozen other charities. Living in Devon, listening to Mozart and working with children have provided Michael with the ideas and incentive to write his stories. He spends half his life mucking out sheds with the children, feeding sheep or milking cows; the other half he spends dreaming up and writing stories for children. "For me, the greater part of writing is daydreaming, dreaming the dream of my story until it hatches out - the writing down of it I always find hard. But I love finishing it, then holding the book in my hand and sharing my dream with my readers." Michael received an OBE in December 2006 for his services to literature.